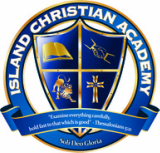 Island Christian Academy is committed to building a strong Biblical, spiritual, moral, ethical, and academic foundation in students in preparation for any endeavor into which God may lead them. "ICA has a great academic approach that is biblically based. My kids are getting an education that will set them up for success throughout their entire lives. The teachers are all well educated, caring, nurturing, and set a great example. We feel blessed that we have the opportunity to have our kids in such a great school." Decidedly Academic . . . Distinctively Christian.